What Was Your Scariest Cat Experience EVER? Today I’d like to share my scariest cat experiences. What was your scariest cat experience EVER? I’ve had problems over the years like most of you have with one cat or another getting into mischief. I almost titled this article “my unluckiest cat EVER” because this is actually going to be two different situations I had to face with the same cat. Goldie was a kitten when he showed up abandoned at my mother-in-laws house back in 1985. I already had a few cats at home, but there was no way I could leave this poor gold tabby to fend for himself. He couldn’t have been more than three or four months old. Goldie loved it with us. He stayed inside at night and went outside a lot during the day. I lived behind my mother at the time in a mobile home we’d placed on her property before Laura’s dad and I were married. Laura was just a toddler at the time the first accident happened. I was outside with Laura, who was around two years old at time time. Her dad was a few hundred yards away talking with mama out in her back yard. I was calling Goldie so he could come in and eat. It didn’t take long for me to hear a really pitiful meow. I looked around and couldn’t find my little guy anywhere. Until I looked under our home and saw him HANGING by his neck! There are metal circles made into the underside of a mobile home. I’m not sure what use they are, but Goldie had put his head through one of the circles and couldn’t back himself out. He was literally hanging and slowly choking to death. This was not going to be an easy rescue. For one thing, Laura was an early toddler, meaning she walked at seven months old. So by age 2, she was really on the ball. Somehow, I had to help Goldie, keep an eye on Laura and get the attention of my husband so he could help! I dove under my home and held Goldie up so he could breathe again. At the same time I screamed for Laura’s daddy and my mother. I had to have someone to watch Laura while we worked on freeing Goldie. My husband got under the home with me and we tried unsuccessfully to push Goldie’s head back through the hole. When that didn’t work, I sent my husband inside for some dish detergent to grease Goldie’s neck. That didn’t work either. The only way we could free him was using a small crowbar and a hammer to bend the metal back to make the hole larger. It was a noisy procedure with all the hammering and I can only imagine how terrifying it must have been for Goldie. I often wondered whether Goldie suffered any hearing loss from the hammering that had to be done right next to his ears. After his rescue, Goldie had to have a bath to wash the dish detergent off of his fur. Other than that, he was shaken but uninjured. Goldie stayed with my mother when I moved to Greenwood in 1985. He was happy there and I knew I could visit him on a weekly basis. I’m not sure exactly what year Goldie was poisoned. I remember rushing to the vet after my mother called me and told me she had found Goldie trying to cross back over from the field next to mama’s house when he collapsed. Mama took him to my favorite vet at the time. Dr. Jamison was most likely of the back side of 80 years old, and his experience saved Goldie. I couldn’t believe it when Dr. Jamison told me someone had probably poured a corrosive substance down Goldie’s throat, as his throat and mouth had chemical burns. Goldie had a temperature of 106F. and would have to remain at the clinic for the next three days. We were fortunate that Goldie made it back home in time for mama to rush him to the vet. After his release, Goldie came to live with me for the remainder of his life. He eventually developed crystals in his bladder that had to be drained. This began by Goldie urinating on the kitchen floor, which is something he’d never done in the past. I took him to the vet here in Greenwood several times that last week. It was believed the poisoning had affected his kidneys and bladder and there was no option left other than removing his bladder. It would have been an expensive operation and his quality of life wouldn’t have been good. I took Goldie home and had a final two days to make up my mind what to do about my poor little boy. The next morning I picked Goldie up after he finish eating. I was planning to take him into the living room and rock with him in my lap. As I lifted him, he began hemorrhaging from his bladder. I made the difficult decision to have him euthanized. I’ll never forget him. Goldie getting his head stuck in a small round hole possibly saved Furby from a painful accident. All of you here know how Furby is constantly getting into trouble. If there’s a way to get stuck in or fall off of something, Furby somehow is drawn to that object like a moth to a flame. That’s what happened with the banana box the first week he was with us. We got to missing him one night and Laura commented she’d last seen him in her room. It was then I remembered the banana box in her room. We use them as cat beds for the grown cats, but they can be dangerous around kittens. I ran into Laura’s bedroom and there he was…Furby looking at me with just his head-stuck through one of the holes in the banana box. He wasn’t hanging, but he was definitely stuck! I found my scissors and cut the box hole to free his tiny trouble-making head. For more than three years now, Furby has continued to constantly get into trouble anywhere he can find it. 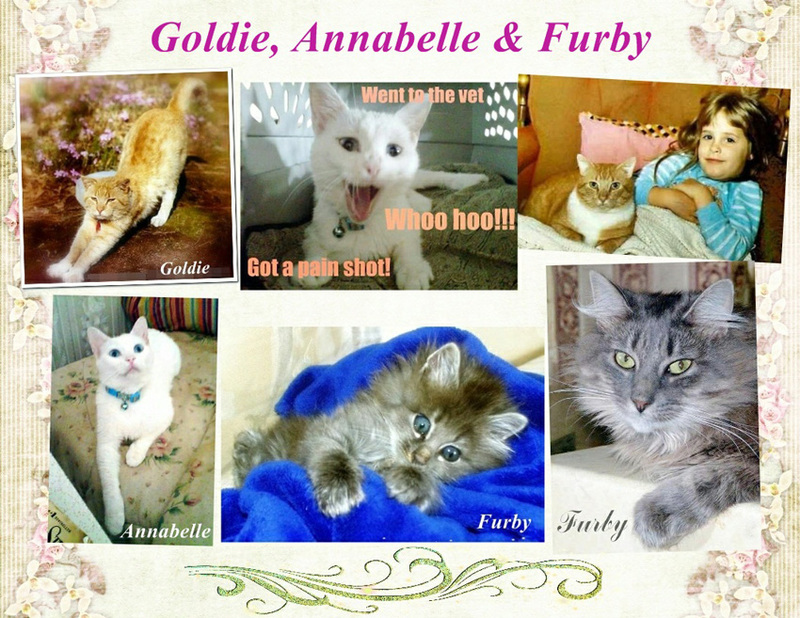 Thanks to Goldie, Furby’s story had a happy ending. I won’t go into it on this article, but our Annabelle also had an accident. I believe it would qualify as my daughter Laura’s scariest cat experience. That story can be seen if you click this link. Have any of you had a scary cat experience you’d like to share? I can definitely understand where the phrase “curiosity killed the cat” came from. Dogs may chew things and swallow foreign objects. I believe most cats have the soul of an explorer. They love checking out everything in their environment. Sometimes I believe we as cat companions lose more “lives” than the cat while keeping them out of trouble. Furby has stuck his head through a hole in a banana box, his claw hung in the back of the TV converter box, and he’s fallen off the microwave and TV more times than I can keep count. Last night he underestimated the kitchen bar and knocked his chin fairly hard. He tends to get more embarrassed than injured when things like that happen. Oh well, that’s my boy! What do the readers here think? What was your scariest cat experience? I know from reading your stories here on PoC that a few of you have had life and death situations involving your cats. This collage shows Annabelle after coming from the vet after her accident. Needless to say, she was feeling no pain. She was our deaf white rescue and has her own family now. And that’s my daughter Laura with Goldie in one of his last photos. Laura is chief caretaker to our cats. The baby picture of Furby shows the size he was when he stuck his head through the box hole. The right bottom photo of Furby was made while he was on top of the microwave, which he now looks at with suspicion since he’s fallen off of it on numerous occasions while getting his beauty sleep. This entry was posted in Articles of Elisa Black-Taylor, Cat Behavior, Cat Health, Human to cat relationship and tagged cat behavior, cat health, person to cat relationship by Michael Broad. Bookmark the permalink. I can’t go fishing in my ex’s old fishing spots. We fished every week until he became too sick to go. I haven’t fished at all since he died. That’s ok, Marc. I still haven’t went to see a play at American Players Theater since I was there with my late husband on our honeymoon. I used to love that place and I’d see several plays a season. The theater is outside, and you hike up this trail in the woods to get to it. But a part of me feels that he and I are still there, and if I go there again I’ll disturb that and then we won’t be there anymore. So I stay away, because even though I am happily remarried, I just can’t destroy that memory of my younger self with Danny in that place by creating new memories in that same place. I talk about going again, but I don’t think I ever will. We weren’t created to die. It’s not supposed to be this way. Sometimes a loss is just too much for you to ever be completely normal again. My husband understands. He’s a good man. I don’t think he much wants to hike up a hill to sit in the woods and see a play anyway. I agree with you totally Ruth – it’s about not disturbing something – memories, something you want to leave or keep as it is. Wow these are all frightening. In Canada I had a few scares of my cat not coming home and once she was poisoned by something and I rushed her to the emergency vet. Apart from that I suppose the day I went out looking for Red because I had a feeling he should have at least come in to say hi. When I first saw him it was totally surreal – I’m not sure exactly if that is fear, ‘scary’ – it’s not something I have ever experienced before. I still haven’t walked along that bit of road and I still walk home the slightly longer way because I can’t bring myself to walk home the way I use to when he was alive. I will have to eventually do it. The other day my ex was staying over and we went to the late night store and literally walked around 3 sides of a block instead of walkin the one side to get to the same point. It all comes from fear of having to relive that moment and the feeling when I first discovered him. I can feel the tension re: the Red story. My scariest experience was the day Monty tried to eat a bee and got stung on his tongue by a giant bumblebee. The vet suggested Benadryl, so I put half a tablet in some food, but Monty choked on the food. He ran under the couch. I was able to get him to come out and as I picked him up his tongue was hanging out of his mouth, his little body was stiff and he wasn’t getting any air. I felt so helpless. But then he was able to breathe again somehow. I threw him in his new carrier and called the vet on the way. Monty was very good for the vet when he could barely breathe, allowing the vet to give him two injections without so much as a peep. Four hours later when the vet decided it was safe to release him, Monty was back to his old self, snarling and growling at the vet. The vet said that Monty was like a different cat once he felt better. That’s when I knew he was going to be ok. I had another scary experience with Mutsy in about 1987 or ’88. I gave her a little of my pizza and she choked on it. She was sitting on my bed in front of me (I was eating pizza sitting in bed, watching tv) and she started pawing at her throat, not making any sound. I knew she wasn’t getting any air so I grabbed her little tummy just below her ribs and gave a quick hard squeeze. The pizza shot out of her mouth and she was fine. I didn’t actually have time to be scared. It was much worse with Monty, because there was no quick fix that was going to get him breathing again and even though the vet is just a few blocks away, I didn’t know if it would be close enough. Monty hates the cold snow out there, but I like it because there aren’t any bees for him to tangle with. The Monty story is tense! I get tense reading it. Now more important matters. How often do you sit in bed eating pizza and watching telly? Hedonistic. When I get nervous I crave sugar. I write better when I have either a donut in hand or a bag of boiled peanuts by my side. I think it was pretty late at night and I was eating something before turning in after working my shift in the kitchen at the local nursing home. That was back in the day when I could eat pizza right before bed and not gain any weight. This is quite a painful post for me. Two scary cat experiences come to mind. When Binnie was dying of kidney failure she spent hours, days outside on the lawn (it was a warm summer). One day I spotted her sleeping over a drain on the driveway to the block of apartments I live in. The drain was bang in the middle of the drive at the entrance to the complex. She was old, ill, tired and asleep. She could easily have been killed by a car or lorry entering the complex. I went out and went around her towards the entrance to approach her from the entrance side in case she ran towards the road. I approached carefully and spoke gently at the same time. She stayed put. I picked her up and brought her inside. Shortly after I kept her in and shortly after that she was put to sleep. Miss her.